This inflatable Army themed Obstacle Course rental gives you all the benefits of regular Obstacle course plus the ability to choose your art panel to fit your party theme. 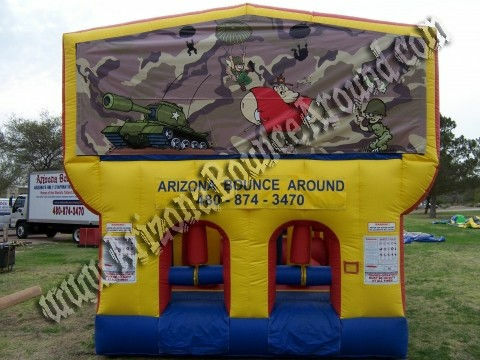 This Army obstacle course goes perfectly for any event and with our Army Tank Bounce House. Rent an Obstacle Course in Phoenix or Scottsdale AZ from Arizona Bounce Around to Race Co-workers, parents, teachers, Teens or small kids over 3 years old. Add our Megaphone rental or wireless Stop & Go light for greater control of the race. Rent an Inflatable Obstacle Course in Phoenix or Scottsdale AZ for your next school or Church from Arizona Bounce Around and have a great party. 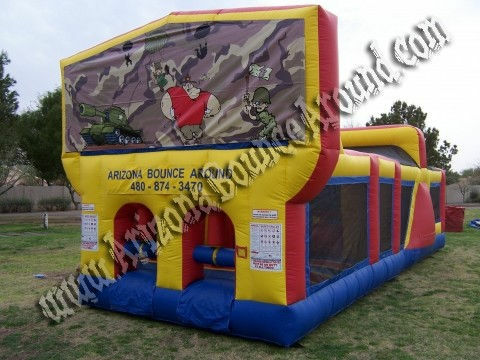 This Army themed inflatable obstacle course rental price includes standard set up. Standard setup is considered a real grass area that we can stake into the ground. Within 80 feet of sufficient electrical supply. Delivery and removal within included delivery area with no restrictions for delivery, set up or pickup. We do not install this inflatable obstacle course on dirt or sand but it can be setup on asphalt, concrete or artificial grass by adding sand bags to your order.